My friend Michael came over this year for the second time to experience the Easter Week here in Linares. 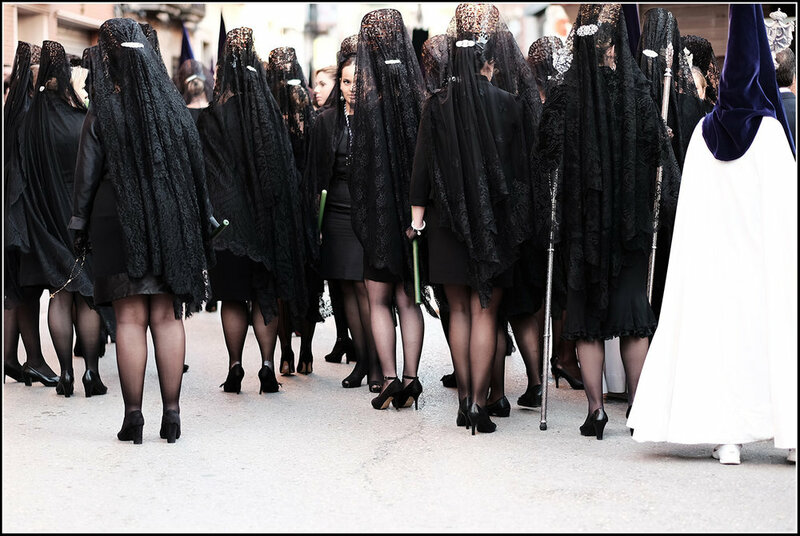 Linares happens to be an amazing place for watching the Easter processions. The city is off the beaten tracks in a positive sense. The Easter week here offers lots to see, at the same time the place is not flooded by tourists. There is a high number of different processions throughout the week and they are large and important both artistically and in size. The musical performances of the different accompanying bands are very impressive. We had a good time together, mingled with the people, watched everything close up and from a distance. We were out and about in the morning, in the afternoon and during the night, we waited for processions to arrive and ended up exhausted after standing around for some hours. Sometimes we were lucky to find a bar to have a drink, often it was impossible to enter even a café. Everybody was on the street, familys and friends, young and old. Most people dressed up very sophisticatedly: suits, ties, polished shoes, beautiful dresses and sunglasses. It was all about seeing others and beeing seen. Of course Easter Week is, overall, a very baroque event and very folkloristic yet it comes across as believable and authentic because it is, I think, backed up by a profound religious feeling of many, participants and spectators alike. "Holy Week in Spain is the annual commemoration of the Passion of Jesus Christ celebrated by Catholic religious brotherhoods and fraternities that perform penance processions on the streets of almost every Spanish city and town during the last week of Lent, the week immediately before Easter."